EXPERIMAC franchise stores are listed for sale from coast to coast. While there are 96 Experimac computer store locations listed on the company website, we found 27 listings for Experimac franchise resales. Why are more than 20% of Experimac franchises up for sale? The purported reasons the owners are selling is listed below. (UnhappyFranchisee.Com) Experimac franchise owners invest between $150K to $350K to open their franchise locations, and commit to a term of 35 years. Yet it appears that as many a 25% of the franchised computer and cell phone repair stores are for sale, some at fire-sale prices. 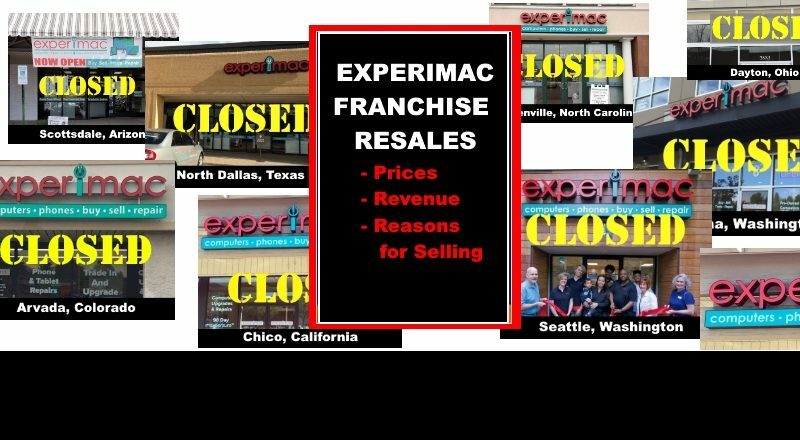 Many Experimac franchise owners appear to be desperate to exit the franchise system, despite only having been open for a couple of years. While a few have successfully sold their stores, many others, it appears, have closed their doors and defaulted on their loans. See the closed location list project here: EXPERIMAC Franchise Closed Store List. See our post on franchisee complaints here EXPERIMAC Franchise Complaints and here EXPERIMAC Franchise Complaints – Part 2. NOTE: All of this information has been compiled from public sources and is accurate to the best of our knowledge and belief. We publish it here to prompt discussion and invite corrections and clarification. If you are performing due diligence, you should independently verify all information – whether it comes from us, the franchisor, or 3rd parties. Please share your opinions and information regarding Experimac resales with a comment below or an email to UnhappyFranchisee[at]gmail.com. * Information are estimates. Comments and corrections invited. * These revenue numbers have not been verified and may or may not be accurate. Always have a professional review financial statements thoroughly before buying a franchise resale. OH Fairfield County, OH $50,000 $79,500 Established: 2017; Also says $10-15K Monthly Sales Less than 1 year. Motivated seller. SC Columbia,(Lexington County) $299,800 $300,000 Established: 2017 center of the busiest shopping area of the Midlands. It’s not clear whether actual franchise owners are providing the information for these franchise resale listings. Some of the reasons given for franchisees who recently committed to a 35-year agreement suddenly want to go a different direction seem a bit… unconvincing. Perhaps the most creative is the owner who “successfully met store growth goals” within 2 years of the 35 year agreement and now must find a bigger dragon to slay. Invitation: We are a discussion site and welcome respectful dialogue from all sides of every issue. We try our best to be accurate, but we make mistakes. It is our policy to invite individuals and companies discussed on this site to provide corrections, clarifications, explanations, rebuttals or statements expressing their points of view. You may do so in the comment section below or by sending an email to UnhappyFranchisee[at]gmail.com. Thanks for participating in this important conversation! I would be curious to know how many stores, if any, have turned a profit? I was told by the sales person when purchasing the Franchise that “most stores open over 9 months are averaging $100,000 in sales a month.” I personally had 1 profitable month while in business and made $1,500 that month. Is anyone making profits regularly?